Facebook has said that it is banning Myanmar’s powerful military chief and 19 other individuals and organisations from its site to prevent the “spread of hate and misinformation”. A report appearing in FIRSTPOST on Monday stated that the social media giant was heavily criticised for permitting itself to be used to “inflame ethnic and religious conflict in the country, particularly against minority Rohingya Muslims”. It has been accused of being lax in fighting online misinformation and manipulation in many countries, but Myanmar is one where it has been most closely tied to deadly violence. The report further stated that some 7,00,000 Rohingya have fled from Myanmar’s western State of Rakhine over the past year in response to a brutal counterinsurgency campaign by the military, which has been accused of massive human rights violations. Critics accuse the military of carrying out ethnic cleansing, or even genocide, an allegation denied by the Government, which says it was responding to attacks on security forces. Facebook said on Monday that it has also targeted pages and accounts that pretended to provide independent news and opinion, while covertly promoting messages of Myanmar’s military. It said it was deleting 18 Facebook accounts, one Instagram account and 52 Facebook pages. Four high-ranking officers and two military units targeted by Facebook were also put on a US Government blacklist earlier this month for human rights abuses. The sanctions block any property they own within the US and prohibit US citizens from engaging in transactions with them. The US already maintains restrictions on visas, arms sales and assistance to Myanmar’s military. In June, the European Union (EU) imposed similar sanctions on seven senior Army and police officers, all of whom are on Facebook’s blacklist. 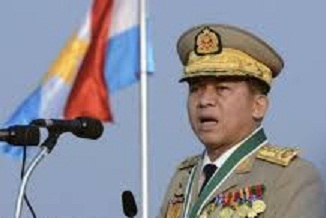 The United Nations (UN) investigators on Monday called for an international probe and prosecution of Myanmar’s Army chief and five other top military commanders for “genocide against the country’s Rohingya minority”.